SALT Reduction Becomes Major Sticking Point In Tax Overhaul. So What Is SALT? 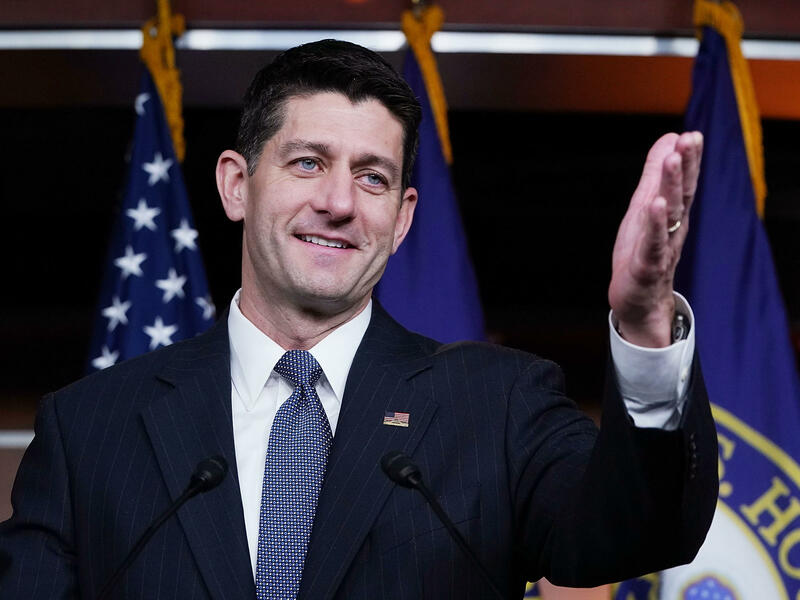 House Speaker Paul Ryan answers reporters' questions moments after the House narrowly passed a budget, 216 to 212, beginning a process for the Senate to move forward on an overhaul of the tax code. For some Republicans, the tax overhaul would taste better with SALT. The House GOP narrowly passed a budget resolution this week, taking an important first step on the path to overhauling the tax code. But 11 GOP lawmakers voted against the measure out of concern the tax bill would eliminate the deduction for state and local taxes, or SALT. That tax break is especially popular — and valuable — in high-tax states such as New York, New Jersey and California. The SALT deduction is one of the few that the Trump administration has singled out for the chopping block. Treasury Secretary Steven Mnuchin told NBC's Meet The Press he wants to get "the federal government out of the business of subsidizing the states." According to the Tax Foundation, more than half the total savings from the deduction goes to taxpayers in just six states: California, New York, New Jersey, Illinois, Texas and Pennsylvania. Among those, only Texas is reliably Republican — and Trump won Pennsylvania in the 2016 presidential election. There is no shortage of GOP House members from those states who are sure to get an earful from constituents defending the tax break. Some of those lawmakers will fight to avoid the no-SALT diet. And, as this week's 216-212 vote on the budget resolution shows, Republicans have little margin for error. Rep. Kevin Brady, R-Texas, chairman of the powerful Ways and Means Committee, had acknowledged the concerns from pro-SALT lawmakers and said they'll have to be addressed somehow. "They made it clear," Brady told reporters. "They need this problem solved before they vote 'yes' on tax reform." Now, there's a compromise among Republicans. Brady says the deduction for local property taxes will remain in the House GOP bill, but the deductions for income and sales taxes are still expected to be cut. People with higher incomes tend to rely on deductions for income tax, while those with lower incomes tend to value the property tax deduction more. Though, the lion's share of SALT deductions benefit those with higher incomes. Bloomberg first reported the decision and added that Rep. Chris Collins, R-N.Y., who was raising major concerns about scrapping the SALT deduction, welcomed the move predicted it would be enough to resolve concerns from other Republicans. Democrats have also defended the SALT deduction. Democratic House leader Nancy Pelosi tweeted earlier this month that half of households that claim the SALT deduction make less than $100,000 a year. While it's true that many middle-class households claim the SALT deduction, it's the wealthy who get the lion's share of the savings. According to the Tax Foundation, nearly 90 percent of the value of the deduction goes to families making more than $100,000. Lawmakers, along with the administration, have promised to eliminate various tax breaks to help offset the revenue the government stands to lose by cutting individual and corporate tax rates. But the administration has vowed to preserve some of the biggest breaks, including the deductions for mortgage interest and charitable giving. Doing away with the SALT deduction is projected to save the government between $1.3 trillion and $1.8 trillion over the next decade. If lawmakers decide to preserve the tax break, they might have to find that revenue elsewhere. Brady has suggested limiting the tax break for retirement savings, although the president pushed back hard against that idea. The Ways and Means Committee chairman plans to release a draft text of the tax bill next week. GOP leaders hope to hold a House vote on the plan before Thanksgiving, with or without SALT.